Wow! Christmas is in just a few days! Thought I would share a tour of some of my decorations before the big day. 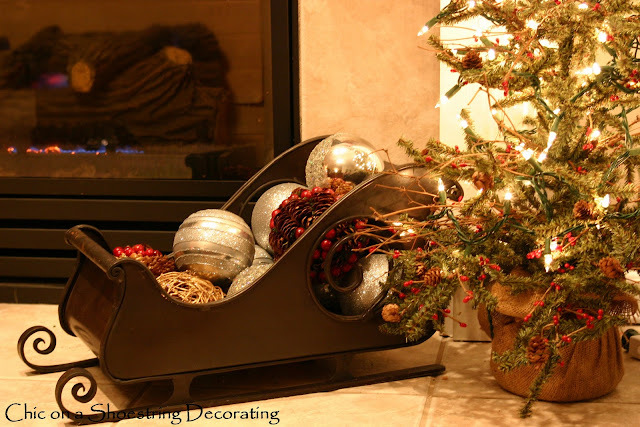 But before I share my "Christmas Extravaganza" I have to ask... does it seem like a common Christmas decorating theme this year in blogland is "simple". I've seen lots of people doing some "minimalist" and "simple" decorating and loving it. Well peeps, I missed the boat on that one. I've been decorating my rear off since the week of Thanksgiving! My secret suspicion is that all those minimalists are just being lazy decorators!? After all, who wants to drag 20 rubbermaid bins covered in dust out of the basement only to find smashed garland with dead Christmas lights inside? It's much easier to just pull out one or 2 and say "I'm loving the simple look this year, it's just lovely." Right?! Totally easy!!! Ok, ok... I'm totally kidding about being lazy, I've seen some just beautiful "simple" Christmas decor. I just love decorating so much that I can't stop myself! Anywho, I'd love to share my not-so-simple decor. It is only not-so-simple because it required lots of rubbermaid bins to be drug up from the basement, not because I did anything really complicated. Here's a little tour of my kitchen and family room. These rooms are open to each other and have a red, white, and a little bit of silver and peppermint candy theme going on. Don't mind the dorky under the cabinet generic Ipod music player/radio... and no I didn't make the sign but how easy would it be to make?! Probably not as easy as me buying it for $3 after Christmas last year. Island centerpiece... Mercury glass tree under cloche. Mantel reindeer who weighs about 20 lbs even though he's less than a foot tall. Sleigh and mini tree at fireplace surround... would you believe my toddler hasn't bothered this at all and it's right near where he plays all the time! Don't forget to come back late tonight for Flaunt it Friday! Wow, what a great tour. I love it all.